On the market for a new PA system? Then you’ve come to the right place! 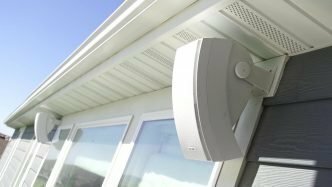 In this article, we discuss the best PA systems of 2019 with options to suit just about every application. This article focuses more on the smaller, compact systems but we do feature two larger-sized PA Systems from two professional audio brands. Purchasing a new PA system can be confusing with all the unfamiliar jargon. Be sure to read through the next section explaining some of the technical lingo as well as our detailed buyer’s guide at the end of this article. PA is the acronym used for a public address system which refers to a speaker (or speakers) used to produce sound (speech or music) to an audience. A PA system can be made up of a single speaker with a microphone, MP3 player, or even a multiple speaker set-up found at concerts and festivals. Wattage is often the primary metric people look at when buying speakers. Watts is the measurement of audio power transferred from an amplifier to a speaker. Wattage is important because it determines how powerful your speakers are. The more watts, the bigger the audience and venue you’re able to fill. Watts is not a measurement of volume – that is measured in decibels (dBs). It’s important to note that you should only take into account two wattage specifications when considering a PA system – RMS (root means squared) or peak output. RMS is the average power output an amplifier will produce while peak is the maximum power output. Some manufacturers will include a Program Power (P.M.P.O.). This is an irrelevant metric and should be ignored. Only consider RMS and Peak, with RMS being the most important metric as this is the nominal/ average power output your speakers will produce. In simple terms, a decibel is a measurement to which how loud something is. Similar to how miles is used to measure distance. The amount of decibels a speaker can produce is usually listed under ‘sensitivity’ on a specification sheet. This universal standard for calculating sensitivity is by measuring 1W of sound at 1 meter. The sensitivity and wattage specs should be considered together to determine how loud and efficient a speaker will be. It’s tough to gauge exactly – only when you actually hear a speaker can you determine the speaker’s “truth”. Frequency response is a difficult spec to determine the sound profile of a speaker on paper. Human hearing can pick up frequencies from 20Hz to 20kHz, which is often referred to full-range (as this is the full range of human hearing). Many speakers list a full-range response but what this actually sounds like in practice is something completely different. This is because a frequency response is not perfectly linear. You can have a 20Hz to 20kHz response with some frequencies being louder than others. For example, a 10” speaker is not efficient enough to produce sub-bass frequencies at high volumes but can produce mid-range and high frequencies very well. The typical 10” speaker can have a 20Hz to 20kHz frequency response but the 20Hz to around 200Hz (all the sub frequency range) will be up to 12dB lower than the rest of the frequency range. So listening to how a speaker performs is very important to determine exactly how much of the frequency response is audible and at what levels. EQ stands for equalization and can be used as a noun or a verb in the sound industry. As a noun, it describes a piece of equipment used to adjust audio frequencies. As a verb, you EQ a voice or instrument to boost or cut frequencies to get your desired sound. On all professional mixers, as well as some entry-level units, you will have gain and volume on an input channel. At first glance, they appear to do the same thing – turn the volume up and down. They do, but for different uses. Take a garden hose with an attachment on the end. By opening and closing the hose attachment you can increase and decrease the volume of water that comes out. However, the tap determines the pressure you send to the actual hose attachment. So if the tap is turned on a little, you won’t have a lot of water to work with, too much pressure and you’ll battle to control the volume of water effectively. Think of gain as the tap and volume the hose attachment. You want to open the gain so you have enough of an audio signal to work with but not too much that you can’t push the fader to at least 90% on the mixer. A pad is an attenuation switch which allows you to decrease the input of a channel or piece of equipment. Usually, a pad will range from -10dB to -30dB (depending on the mixer). However, the most common is -20dB on a mixer input channel. A pad is useful for instruments which produce a high-gain output – especially guitars, keyboards, and sometimes vocals. When the input signal is significantly high and you can’t gain down any lower, a pad is used to drop the level giving you better control. A speaker driver is just another name for a speaker. Usually, we refer to a speaker as the whole unit while the driver is the actual speaker or tweeter inside the enclosure. A driver can represent the smallest tweeter right up to a large 18” driver. An XLR is a three-pin audio connector used in professional audio equipment. The Bose L1 Compact is an ultra-lightweight, compact PA system. The system consists of a subwoofer with a compact mid/high speaker configuration. Also included are two stand extensions. The speaker can be set up at three different heights. The collapsed position, which has the mid/high inside the subwoofer, stands 16.5″ high. This position is best for talking at a small conference or lecture with the speaker on a table (at head height) in a room where participants are generally seated. With one of the extensions in place, the speaker stands at about 4ft. This is great for a small conference venue, boardrooms or classrooms. The last position is extended position with the speaker standing 6.5ft high. Best for larger audiences with a speaker, band or DJ. The two extension pieces fit in a canvas carry case and weigh just 2.3lbs, while the subwoofer and speaker fit together for travel and weigh a combined 27.6lbs. When completely packed up, the Bose L1 Compact can easily fit in the trunk of a car or even on the back seat. In fact, even two of these systems could fit side by side in a trunk with room for more gear. On the rear of the subwoofer are the inputs, outputs and control panel. There are two input channels on the L1 compact. The first is a single XLR with volume, bass and treble adjustment. The second is a line input with a choice of either a ¼ inch, ⅛ inch or stereo RCA input. The second channel has a separate volume but no tone control. Both inputs have Bose integrated ToneMatch® technology which optimizes the input and sound for either voice or acoustic guitar. The outputs include a ¼ inch jack and stereo RCA. If you need more inputs, you can purchase either the Bose T1 ToneMatch or T8S ToneMatch digital audio mixer designed specifically for Bose L1 speaker systems. The ToneMatch mixer allows you to set up EQ and FX for each input as well as adjust input gain and volume separately for each channel. This is great for a duo or even a one-man band with multiple instruments. A regular mixer will also work just fine. You will need to use the second or line channel on the L1 Compact with stereo RCA input to connect to an external mixer. 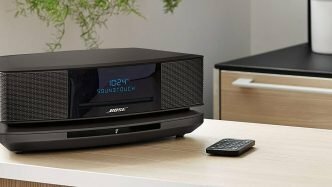 Bose doesn’t list the technical specs for the Bose L1 Compact but the system features a dual subwoofer with 6 x mid/high compact speakers. The 6 mid/highs are configured to deliver a 180° dispersion which is wider than the average 60° of most compact loudspeakers. This means, for small rooms, you can easily get away with just one stack of L1 Compact to cover the entire audience. The L1 Compact delivers a nice punchy, defined bass which is great for DJs and background music. The mids and highs are clear with good intelligibility. The balance between bass, mids, and highs is great with good separation between frequencies. The Bose L1 Compact is great for small venues, one-man bands or duos, and corporate DJs. The system is ultra-compact taking up a minimal footprint which is especially great for acoustic acts playing in small venues like coffee shops for example. While the L1 Compact does deliver a significant amount of power for its size, I wouldn’t recommend using this system with live drums as they will overpower the speakers, even if you have a double stack set up. For an electronic drum kit and percussion, the L1 Compact will work fine. Due to its small size, the L1 Compact easy to carry and transport for one-man setups, even using a small sedan. For schools, churches and community centers looking for a portable utility PA, the L1 Compact is perfect as it takes up very little room, it’s easy to carry and set up. The Yamaha STAGEPAS 400I is a premium PA system at an affordable price. The system comes with two powered 8” speakers and an 8-channel analog mixer. Two ¼ inch speaker cables and power cables for the speakers and mixer is also included. You will have to purchase the speaker stands separately. The system is designed for the speakers to double as storage. On one of the speakers, there’s a recessed compartment with a cover to store all the cables. On the second speaker is a similar recess but this one holds the mixer. So, excluding the speaker stands, you can essentially carry the entire system with a speaker in each hand. With everything stored together neatly, you don’t have to worry about forgetting cables etc. Yamaha also sells an awesome padded case which holds both speakers and an extra pouch for more cables and accessories. The case is on wheels so it’s easy to move around for one person. With or without the case, the STAGEPAS 400I will easily fit in the trunk of a sedan. The STAGEPAS 400I compact mixer features four XLR inputs which can all be switched to mic or line level. Two of the XLR inputs are configured to take either XLR or ¼ inch connectors. The fourth XLR channel even features a high impedance switch for instruments. There are two stereo channels. The first channel takes either 2 x ¼ inch or stereo RCA connectors. The second stereo channel is set up for either 2 x ¼ inch, 1 x ⅛ AUX or USB. These channels are great for keyboards, MP3 or other music players. The stereo channels can be switched between mono or stereo. All the channels have bass and treble EQ with a 15dB cut or boost. Additionally, the four XLR channels have Yamaha’s SPX digital reverb with separate level adjustment for the effects. On the master control panel, you can choose between hall, plate, room or echo effects. Yamaha has even included a foot-switch control so you can mute and unmute the effects. If you operate as a one-man band or duo with no sound engineer, you’ll appreciate this feature. Having a foot switch means you can mute and unmute vocal effects without having to walk over to the mixer, or worse, leave the effects on at the end of each song. This small feature will make your performances look and sound a lot more professional. The STAGEPAS 400I mixer also features a built-in feedback suppressor which is great if you’re working with sensitive headset microphones. There’s also a pre-programmed EQ selector which allows you to choose between speech, music or bass boost. The bass boost is useful when playing music from an MP3 player or DJ. There is also a phantom power switch which sends phantom power to channel 2 if needed. All the outputs are ¼ inch jack outs. Aside from the master left/right, you have a stereo monitor output and subwoofer out. Each STAGEPAS 400I speaker features an 8” driver with 1” tweeter capable of producing 200W each. This is enough sound for about 150-200 people, depending on how the room is set up. The STAGEPAS 400I speakers deliver excellent clarity across the mids and highs with great intelligibility for vocals. Without a subwoofer, the system does lack in sub frequencies however, the STAGEPAS 400I does a good job of producing a solid punchy bass sound. 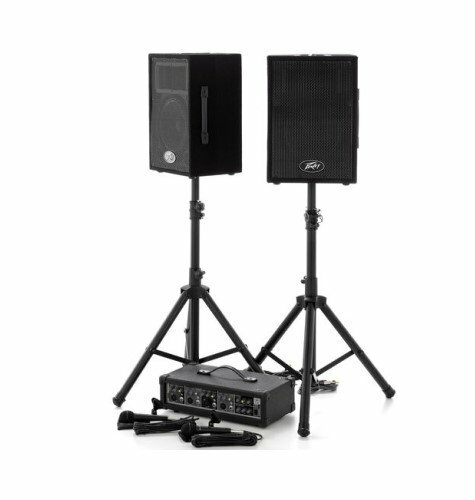 Due to the STAGEPAS 400I’s compact size, the system is perfect for one-man bands, duos or even a three-piece. If you’re looking for a small utility PA for your school, church or community center, the STAGEPAS 400I is versatile enough for a multitude of applications. With only 8” drivers, the STAGEPAS 400I is not suitable for a full band with drums. The drummer will easily overpower this system. Stands and cases sold separately. The Fender Passport Conference is an ultra-compact PA system. When packed up, the Conference fits together like a suitcase weighing just 31lbs which is small enough to carry in one hand. 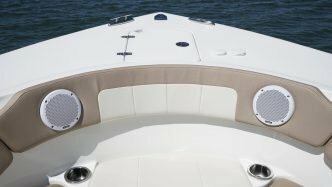 The system consists of two 5.25” powered speakers with a five channel mixer. You also have the option of purchasing the accessory bundle pack which includes speaker stands and cables. The Conference mixing console is a simple five channel mixer with three mono channels which can take either XLR or ¼ inch jack. There is a tone and volume control for each of the three channels as well as a 20dB pad for instruments. The stereo channel allows for two ¼ inch jack or a single ⅛ inch AUX input. The channel also has a separate tone and volume control. At the bottom of the mixer is a ¼ monitor or headphone output with its own volume control. At the top, you’ll find the master volume. The master left/right ¼ inch speaker outputs are on the rear of the mixer. Having the speaker outputs on the rear is a good way to separate the inputs from the outputs making the Passport Conference a simple system to set up and operate, even for those who are not tech savvy. The mixer is neatly laid out with clearly large rotary faders and no clutter to distract or confuse. Each Passport Conference speaker features a 5.25” driver with two 2.75” tweeters. With the two large tweeters, the Passport Conference is perfect for speech and conference applications. The speaker delivers excellent vocal clarity which is primarily what this system was designed to do. The small 5.25” driver offers enough warmth for vocals, background music or an acoustic guitar. 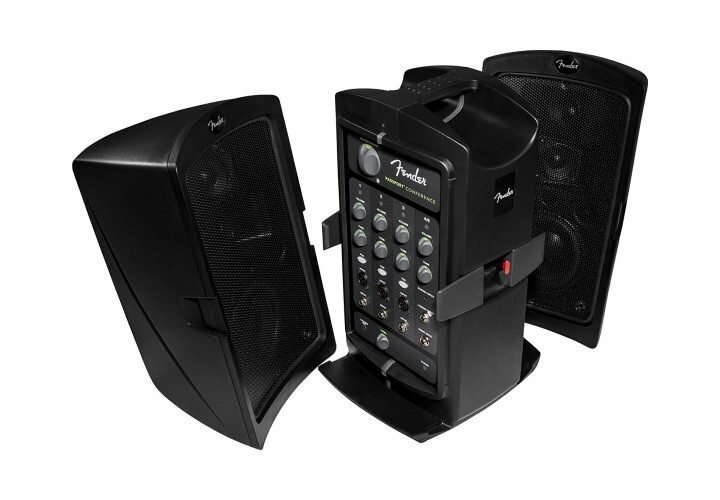 The Fender Passport Conference was designed specifically to be a portable, easy to set up conference PA system. It’s excellent for any spoken voice applications and could even be used for wedding ceremonies where there is no PA system installed. The system is best suited for small audiences of 100-150 people. While the Fender Passport Conference could be used for a one-man band set up, the mixer doesn’t have EQ or vocal effects. The Passport range from Fender includes two slightly larger systems the Passport Event or Passport Venue which are better suited for musicians. Both the Event and Venue have vocal effects and EQ. The systems are also significantly more powerful than the Conference system for medium to larger venues. Stands and cables sold separately. 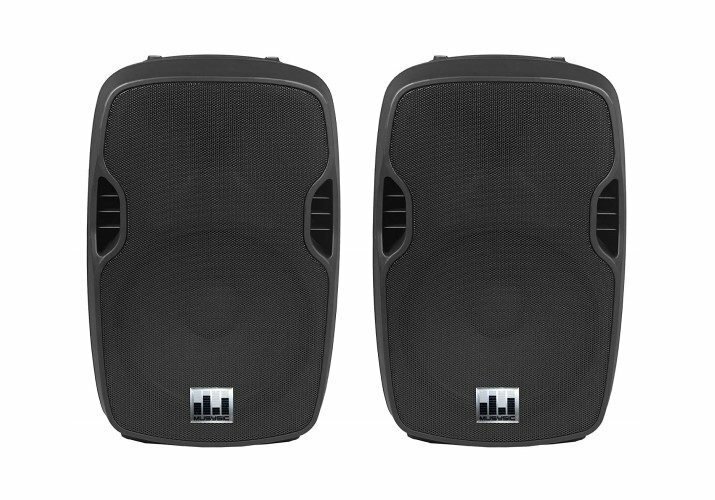 The BEHRINGER EUROPORT EPS500MP3 consists of 2 x 8” passive speakers with a 500W powered mixer. The rear of each speaker is recessed for storage. On one speaker you have an empty cavity which offers enough room for storing the two 20 foot speaker cables and mixer’s power adapter. The second speaker is designed to store the 8-channel mixer. Each EUROPORT EPS500MP3 speaker has a large handle and weighs less than 20lbs making the system easy to carry and transport. The EUROPORT EPS500MP3 comes with a feature-packed 8-channel mixer. There are four switchable mic/line mono channels with the option of either an XLR or ¼ inch input. Each mono channel has a volume control with bass and treble adjustment and the ability to switch reverb effects on or off. Volume for the reverb is adjusted on the master control panel. The first stereo channel allows you to choose between stereo ¼ or RCA input while the second stereo channel allows for stereo RCA or USB. The USB input can be via the master control panel with buttons for play/pause, skip forward/backward and random or shuffle. Lastly, you have a BEHRINGER wireless USB input. This input is compatible with the BEHRINGER wireless handheld microphone systems. The USB port can take either a single or dual BEHRINGER wireless handheld. Beside the master volume control is a VOP button. When engaged, the VOP will automatically duck music under any speech which is great for a quick announcement without having to turn down the music. Next to VOP is also the Contour button which has two pre-programmed EQ settings for voice or music. The EUROPORT EPS500MP3 features two passive 8” speakers powered by the 500W mixer amplifier. The 8” speaker does a great job of delivering a solid bass sound, even though it lacks in the sub frequency range which is expected of a speaker this size. The mid-range is good but a little boxy sounding with vocals. The highs crisp and clear giving the speaker good intelligibility for speech applications. The EUROPORT EPS500MP3 is designed to be compact and out of the way in small to medium-sized venues. With the mixer mounted in the rear of the speaker, the speakers can be placed in a small area taking up a minimal footprint. The VOP feature allows you to have the system play without worrying about a sound operator to turn down the music for quick announcements. This is especially great for small venues who don’t have dedicated technical staff. If you choose to purchase the BEHRINGER wireless microphones, you can set up the EUROPORT EPS500MP3 playing music off the USB port eliminating the need for any cables. With the mixer mounted in the rear of the speaker, you don’t have any equipment other than the speakers and microphones visible. Great for weddings and corporate functions where organizers regularly insist on equipment being hidden as much as possible. The EUROPORT EPS500MP3 is also great for one-man bands or duos, churches, schools, and community centers. The system is lightweight, affordable, easy to set up and delivers a significant amount of sound for its size. Great for venues of up to 200, depending on the layout. The EUROPORT EPS500MP3 is not powerful enough for a full band with drums. JBL is one of the leading professional audio manufacturers in the world. 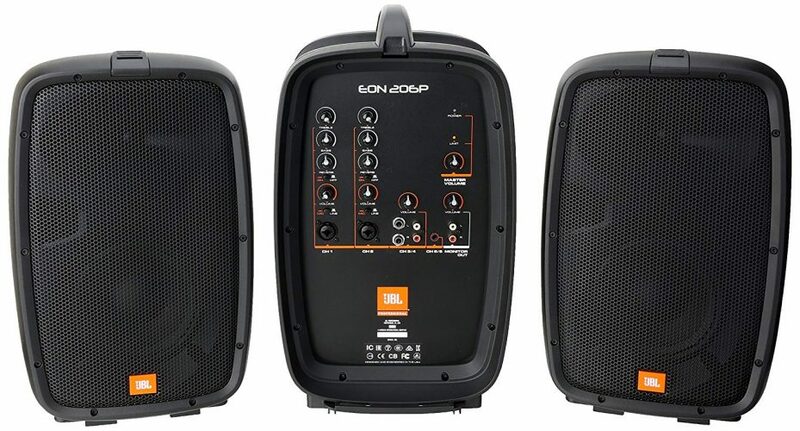 Their EON range is quite extensive with the EON206P Portable PA System being the smallest and most compact. The EON206P system consists of two 6.5” powered speakers with a 4-channel mixer. The system fits together neatly like a suitcase for easy storage and transport. At 25lbs, the EON206P system is light enough that anyone can carry and set it up. The system does not include speaker stands so you’ll need to purchase these separately if you don’t already own a pair. The EON206P mixer is neatly laid out with two mono channels and a stereo channel. The mono channels can take an XLR or ¼ inch jack with a switch for mic or line input. Each channel has a 2-band EQ, bass and treble as well as separate volume and reverb controls. The reverb also has an on/off switch so it can be disengaged completely. On the stereo channel, you have the option of ¼ inch jack or RCA inputs. The stereo channel only has a volume control, no EQ or reverb. Lastly, there is a ⅛ inch AUX input. There is no volume control for this channel so you’ll need to control this at the source be it an MP3 player, iPad or smartphone. On the main control panel, you have a simple master volume control and stereo monitor out with RCA connection. On the rear of the mixer are the two ¼ inch speaker outputs. The EON206P features two 80W powered 6.5” speakers with 1” tweeters. As you would expect from JBL, the sound quality on the EON206P is exceptional. The bass is rich and warm with excellent clarity in the mid-range and highs. Vocals, instruments, and music all sound really good through these compact JBL speakers. 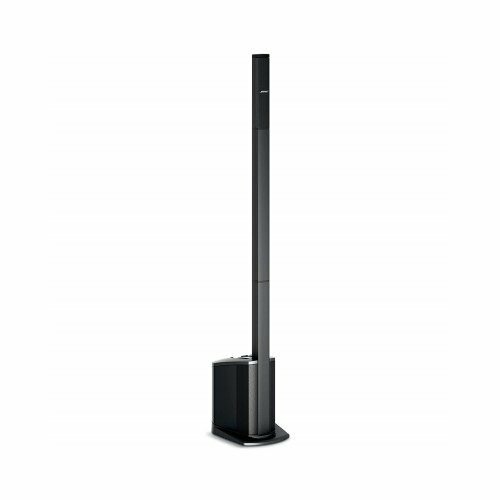 Although the JBL EON206P is limited on the number of channels it has, the system is very versatile for a number of applications. If you’re a one-man band playing in small venues like bars or cafes, then the EON206P is a perfect plug and play system. Having EQ and reverb on each channel is great for adding a bit of life to the vocals and acoustic guitar. You also have the stereo channel for background music between sets. The EON206P is also great as a portable utility PA for schools, churches and community centers who need something compact and easy to operate. With the EON206P’s limited size and channels, it’s not suitable for anything more than a couple of inputs and background music in small venues. If you love the JBL brand and want more power, then, the JBL EON ONE might be a better choice. The system includes a 10” subwoofer with six 2” high-frequency drivers in a line-array configuration capable of producing a combined 380W. The sound from the JBL EON ONE is exceptional with an excellent bass response and detailed clarity in the mids and highs. The system folds up with all the pieces fitting inside the subwoofer weighing 40lbs making it easy to transport and store. The mixer on the EON ONE is identical to the EON206P except that it has Bluetooth pairing so you can stream straight from your MP3 player or smart device. While the JBL EON ONE is head and shoulders above most other compact PA systems in terms of sound, the system does cost a little under $1000 for one speaker stack. So a complete left/right PA system would set you back $2000. If you are a serious performer or, you have a premium venue, this system is definitely a worthwhile investment. For $300 more, you can get the JBL EON ONE PRO which features a built-in 6-hour battery. Perfect for outdoor gigs where access to power sockets is an issue. 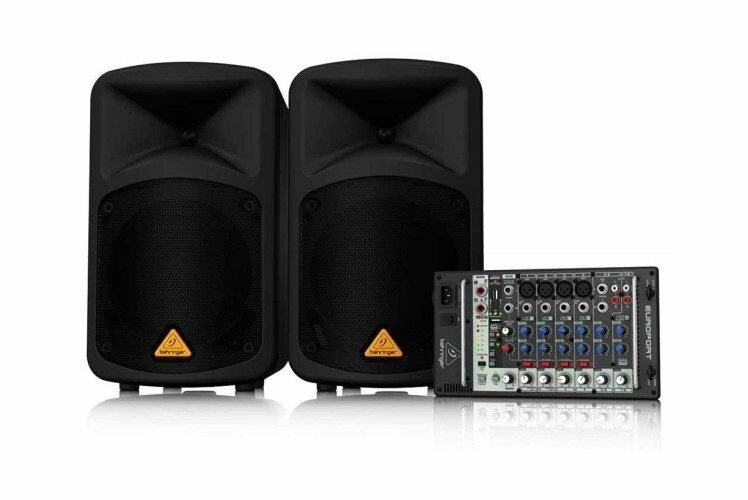 The PRORECK PARTY 15 is an affordable, complete PA system in a box. Included are two 15-Inch speakers with stands, microphone with cable, speaker cable link, and, remote control. The primary speaker is powered with all the inputs and speakon out linking to the second passive speaker. Behind the speaker grille is a built-in 4-color LED light system. A great feature to add to the mood of the party. Each speaker has built-in rubber wheels making them easy to transport and move around. The onboard mixer has three channels, a ¼ inch input for the supplied microphone, a stereo RCA and MP3 channel. The MP3 channel controls the SD card, USB and Bluetooth input panel. The MP3 input panel has controls for switching between modes (SD, USB, Bluetooth), play/pause, skip forward/backward and repeat. The panel can also be controlled via the supplied remote control and is great for creating a playlist on USB or SD and leaving to play as background music. The system has a 5-band graphic EQ to make adjustments according to the venue. Each PRORECK PARTY 15 speaker features a 15” driver with 1” tweeter delivering 100W RMS per speaker. PRORECK advertise the PARTY 15 is capable of 2000W P.M.P.O. This spec refers to program power which means nothing when it comes to the actual power output. You’ll never see a premium brand refer to this wattage specification. The PARTY 15 is an average sounding speaker. Vocals and instruments sound boxy without much clarity. Where the PARTY 15 does shine is for music and DJ setups. 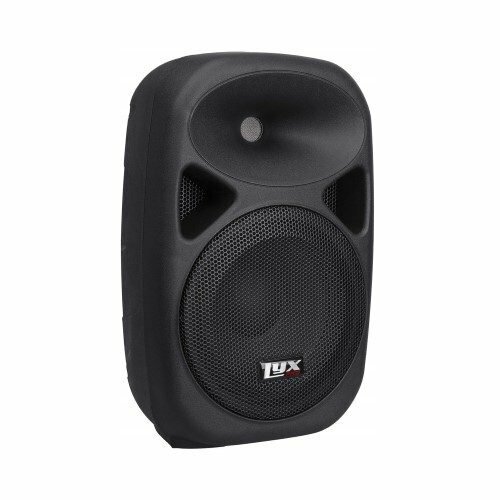 The 15” speakers deliver a significant amount of power with a good amount of bass for genres like hip-hop and dance music. 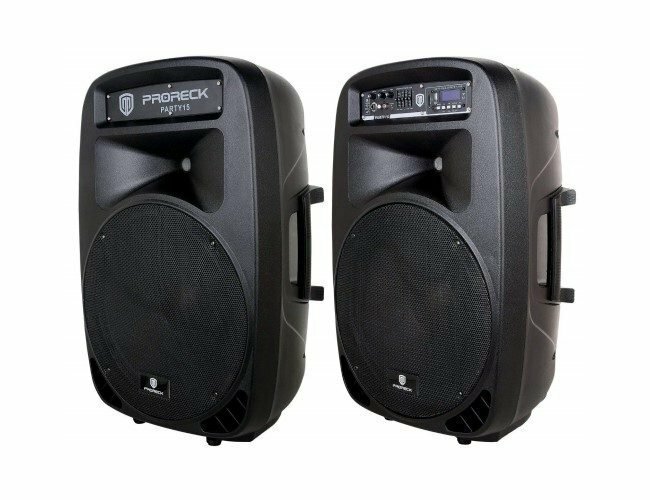 The PRORECK PARTY 15 is perfect for mobile DJs or for venues looking for a system for music and general announcements. At under $300, the PARTY 15 is affordable with everything you’ll need to get started. So if you need a system on a tight budget, then the PRORECK PARTY 15 will be a great choice. I would only use this as a music system for DJs, announcements, and speeches. The PRORECK PARTY 15 is not designed to handle instrument and singing which put a lot of strain on input preamps. The LyxPro SPA-8 is a single 8” speaker PA system with built-in inputs and mixer. The SPA-8 has an XLR Mix Out so you can daisy-chain several speakers together. As this is a simple XLR output, you can daisy chain the SPA-8 to any other powered speaker, mixer or amplifier for a passive speaker. The SPA-8 has a mounting hole for speaker stand which would need to be purchased separately. The LyxPro SPA-8 features two input channels with two input options on each channel. Channel one allows for XLR or ¼ inch jack. There is also a mic/line switch for gain adjustment. Channel two gives the option of ⅛ inch AUX or stereo RCA. Each channel has independent volume control. There is also a third input channel for audio playback from SD card, USB or Bluetooth. The channel has an MP3 display indicating track, which input is in operation and the controls engaged. Below the display are the regular MP3 controls for play/pause, repeat, skip forward/backward. There’s also a mode button to switch between the three inputs. On the main control panel is a volume control marked MP3 which is allocated to the MP3 channel. The SPA-8 has a tone control for treble and bass but there is no master volume control which is unusual. The LyxPro SPA-8 features an 8” driver with 1” tweeter delivering 100W RMS of power. The speaker is surprisingly loud with a decent amount of throw, meaning the sound from the speaker travels far and can easily be heard across a room. While the SPA-8 doesn’t have much in the sub-bass range, it does have a decent low-end punch. The mids and highs deliver great clarity for both music and vocals. The LyxPro SPA-8 is a versatile little speaker. You can use the SPA-8 as part of a left/right PA, a satellite speaker for music and announcements at an event or even as an on-stage monitor for a DJ or musician. The speaker weighs a mere 14lbs measuring 14” high by 9.25” wide making it easy to transport, set up and store. If you’re looking to purchase multiple PA speakers, then at only a little over $100 per speaker, the SPA-8 is an affordable option. With the daisy chain feature, you can connect multiple SPA-8 speakers together which would be great for a distributed PA system at an outdoor sports event, wedding or even a craft market. The SPA-8 is best suited for playing background music and making announcements. Also available is the SPA-8BAT which has a built-in battery with 8-hour battery life. If you need something with more power, the LyxPro SPA series includes a 12” and 15” powered speaker option. The Musysic PA system has everything you will need to get your PA system up and running. The complete system includes 2 x passive 10” speakers with stands and speaker cables, a powered 6-channel mixer, and, dual wireless handheld receiver with two microphones. The system doesn’t come with bags or cases so you will need to purchase these separately. The Musysic powered mixer features 6 mono input channels. The first 5 channels have the option of XLR or ¼ jack while the sixth channel allows for XLR or switches to control the MP3 inputs which is choice between USB or Bluetooth. Each of the six input channels has identical controls. There is both gain and volume, bass and treble EQ, AUX send and pan left/right. There is also a PFL (pre-fade listening) which allows you to monitor each individual channel using headphones. A phantom power switch on the master panel turns 48v phantom power on for all six inputs. At the top of the master panel is a 5-band graphic EQ to tweak the PA system. Below this is the effects engine and AUX send control. You can switch between using the internal effects or external AUX. There is a ¼ send and return to get to and from an effect processor. Lastly, on the master panel, you have a master volume with independent faders for left and right as well as effects master volume. Beside this is a ¼ inch headphone output with volume control. At the top of the mixer is an MP3 control panel. There’s a USB input with LCD display and buttons for play/pause, skip forward/backward and mode to switch between USB or Bluetooth. The supplied dual wireless receiver would plug into two of the six channels to operate. The Musysic PA system features two 10” speakers each delivering 100W RMS power output. The system is surprisingly loud with a lot of throw which can easily carry 100-200 feet. Great for outdoor events like sports days or a street party. Overall, the sound quality of the Musysic PA system is good, but not excellent. The speakers deliver a decent amount of bass however, it’s not a very tight sound and can become a little wooly depending on what you’re listening to. The mid-range is a little boxy but clear enough for vocals and music. At under $500 for the complete system, the Musysic PA is a great entry level PA system for those who need something on a budget. For house parties, a community center, karaoke or a mobile DJ the Musysic PA is a great affordable buy. This system will also be great for a one-man band or duo who are just starting out and need an affordable PA system. For more established musicians, rather go for one of our more premium options like the JBL EON206P or Fender Passport (Event/Venue). Peavy has been designing and manufacturing affordable professional audio equipment since 1965. The Peavey APP Audio Performer Pack is designed to be a versatile small format PA system. The system consists of two 10” passive speakers with cables and stands, two PVi 100 microphones with XLR cables, and, a PVi 4B powered mixer. The system doesn’t include bags or cases for any of the items so you will need to purchase these separately. The PVi 4B mixer is ultra-compact designed to be set up and placed on the floor or table near the speakers. The mixer features four mono input channels with the option of either XLR or ¼ inch inputs. Each channel has a separate volume, tone, and reverb (built-in) adjustment. The master panel includes the master volume, master reverb and tape (RCA input on the rear). Below these controls, you have three tone controls for bass, mids, and treble. On the rear of the PVi 4B is the ¼ inch speaker output (left/right) and next to that a footswitch for the internal effects. Attaching a foot switch will allow you to mute and unmute the reverb without having to touch the mixer. Also on the rear is an RCA input/output and ¼ mix out which could go to a powered speaker, monitor or subwoofer. The first thing you notice with the Peavey APP Audio Performer Pack is that the two 10” speakers deliver a significant amount of volume. They’re really loud! These two 50W RMS speakers deliver more power than some 100W speakers. There isn’t any sub-bass to speak of but the low end does produce a defined bass response. Perfect for acoustic guitars, keyboards or general background music. The mids and highs deliver excellent clarity which is great for vocals and music. For a sound system under $400, the Peavey APP Audio Performer Pack certainly delivers significant power and sound quality. The only place I can fault the Peavey APP Audio Performer Pack is the built-in reverb. 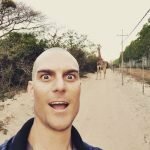 It sounds really weird and unlike any reverb that I’ve ever used. It’s the only part of this system I wouldn’t recommend. 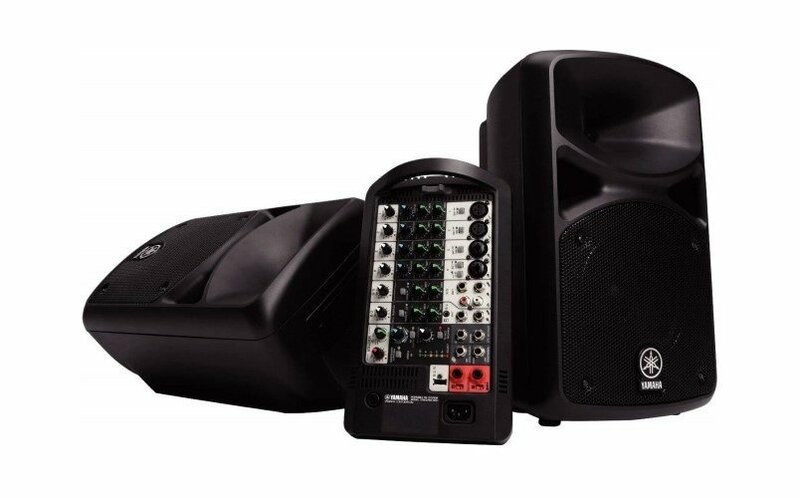 The Peavey APP Audio Performer Pack is a great PA system for small events and venues. The speakers are lightweight and compact making the system easy to transport and store. This is a great PA system for one man bands or duos looking for an affordable PA system with quality sound. The Peavey APP Audio Performer Pack is also great for schools, churches, and community centers looking for an affordable compact utility PA system. The system would also be great for a mobile DJ however, you would want to invest in a subwoofer to supplement the low-end. The Rockville RPG122K PA System includes one powered and one passive 12” speaker. The powered has a speaker output to link to the passive speaker for a left/right PA configuration. There are two speaker stands with a ¼ speaker cable to link the two speakers. Also included is a switchable cable microphone with included cable. The MP3 input can be operated via a remote control which is supplied with the system. The primary Rockville RPG122K powered speaker also doubles as the mixer with all the inputs. There are three channels each with independent volume control. The first two channels offer the choice of XLR or ¼ inch jack inputs while the third channel controls the stereo RCA input and MP3 inputs. A switch allows you to select either RCA or MP3. The MP3 input panel includes inputs for SD card, USB or Bluetooth. There is a mode button to switch between the three inputs. Other MP3 controls include play/pause, track-skip forward/backward, repeat and a six preset pre-programmed EQ. These settings can also be controlled via remote control. In the master section is a master volume, bass, and treble adjustment. A ¼ inch speaker out allows you to link from the primary speaker to the second passive speaker. The Rockville RPG122K is really loud with a decent amount of bass and sizzling highs. The midrange is a little boxy which will be an issue for live musicians and speech, however, the system was designed for music and DJ applications and for this, the RPG122K is perfect. 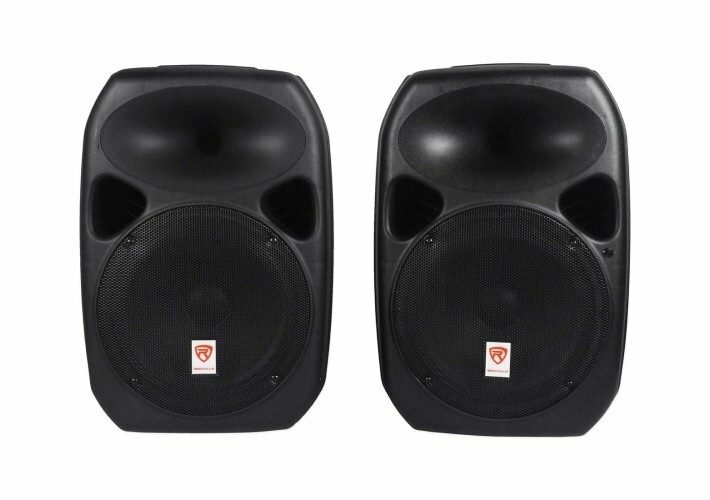 Even for DJs, the RPG122K system does lack in sub-bass so consider purchasing one of Rockville’s RBG subwoofers which are available as 10”, 12”, 15” or 18” active speakers. For the RPG122K I would recommend either the 15” or 18” active subwoofer. The Rockville RPG122K is an excellent rig for DJs, karaoke, and, house parties. The system is designed for these sorts of music applications where you want to get a party started. The Rockville RPG122K system is not recommended for live music applications due to the lack of features singers and instruments required. The microphone works well for announcements but won’t be great for long talks or speeches. We trust you have found this buyer’s guide useful in discovering the best PA systems of 2019. If you’re still unsure about which system will be best for your requirements, here are some recommendations to help you make that choice. If sound quality is what you’re after then the Bose L1 Compact or JBL ONE systems are going to be the best sounding. Keep in mind these are just under $1000 but if you’re serious about sound quality, then this is a small price to pay. Both of these systems are very versatile for use with DJ gigs, live music, conferencing and with enough power for both indoor and outdoor use. It’s important to note that the PA system we’ve included in this article is for smaller gigs, primarily targeting the general consumer. None of these systems are suitable for a full band but for smaller one, two or three piece setups with no drums, there are certainly some options for you. The best system I can recommend for live music is the Yamaha STAGEPAS 400I. The system comes in at under $500 and delivers excellent sound quality for vocals, acoustic guitars, and keyboards. Other options great for live music is the Fender Passport Event or Venue, Peavey APP Audio Performer Pack, Bose L1 Compact or JBL ONE. If you’re looking for a DJ system, the Bose L1 Compact delivers a significant amount of power and bottom end. 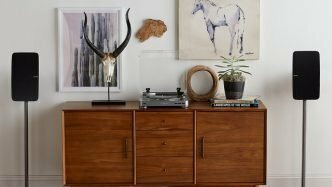 At just under $1000, the system is, however, a little out of most people’s budget. If you’re after something cheaper, the Rockville RPG122K or PRORECK PARTY 15 are both good options. Both of these systems will require additional subwoofers for bigger DJ events, especially for EDM, hip-hop and R&B genres. If you only need a PA system for speeches and background music, for conferences, weddings, meetings etc, then the best option is the Fender Passport Conference PA System. This PA system was specifically designed for this purpose with simple to use controls and exceptional vocal clarity. This Passport Conference is lightweight and folds up to a suitcase size for easy transport and storage. Another speaker that’s great for speech and background is the LyxPro SPA-8 which costs just under $110. If size is your issue, then the smallest PA system is the LyxPro SPA-8. It is however only a single speaker. If you need more than one speaker, the JBL EON206P or Fender Passport Conference systems are both about the same size including two speakers and a mixer in each package. Both of these compact PA systems deliver exceptional sound quality and cost exactly the same price so, essentially, it’ll come down to whether you prefer JBL or Fender as a brand. If you just need a cheap PA system for simple public address requirements or a bit of fun, then the cheapest option is the LyxPro SPA-8 at just under $110. If you require an all-inclusive system, then the Rockville RPG122K and PRORECK PARTY 15 are the cheapest options. The RPG122K costs around $230 while the PRORECK comes in at just under $290. very nice and very brief way through which you have shared information with us..thanks for sharing it with us.